Your rotator cuff is located in your shoulder area. 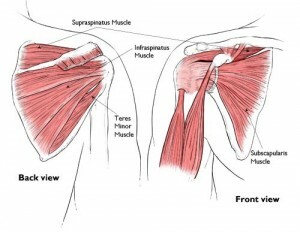 It is made of muscles (supraspinatus, infraspinatus, teres minor, subscapularis) and tendons. It helps your shoulder to move and stay stable. Problems with the rotator cuff are common. They include tendinitis, bursitis, and injuries such as tears. Some tears are not painful, but others can be very painful. Frozen shoulder occurs in about 2% of the general population. It most commonly affects people between the ages of 40 and 60, and occurs in women more often than men. Acromioclavicular Joint injury: The AC Joint makes up part of the shoulder structure. It is the point at which the lateral end of the clavicle (collar bone) meets with the part of the scapula (shoulder blade) called the Acromion Process. It can be identified by sight and touch as the pointy protrusion near the top, outer edge of the shoulder. The joint is surrounded by a joint capsule and is provided additional support by the acromioclavicular and coracoclavicular ligaments (the coracoclavicular ligament is made up of the trapezoid and conoid ligaments.) The acromioclavicular and coracoclavicular ligaments are usually damaged in the most common injuries to the AC Joint. The Acromioclavicular (AC) Joint is a common site of injury particularly for athletes involved in contact and collision sports such as football and rugby, and throwing sports such as shotput. 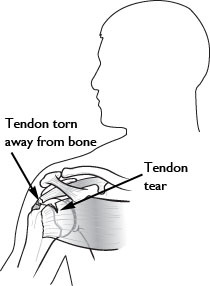 Injury often occurs as a result of a direct blow to the tip of the shoulder from, for example, an awkward fall (ski accident, bike crash, or impact with another player in football. Alternately an AC Joint injury may result from an upward force to the long axis of the humerous (upper arm bone) such as a fall which directly impacts on the wrist of a straightened arm. Most typically the shoulder is in an adducted (close to the body) and flexed (bent) position. TOS is an umbrella term that encompasses three related syndromes that involve compression of the nerves, arteries, and veins in the lower neck and upper chest area and cause pain in the arm, shoulder, and neck. Most doctors agree that TOS is caused by compression of the brachial plexus or subclavian vessels as they pass through narrow passageways leading from the base of the neck to the armpit and arm, but there is considerable disagreement about its diagnosis and treatment. Making the diagnosis of TOS even more difficult is that a number of disorders feature symptoms similar to those of TOS, including rotator cuff injuries, cervical disc disorders, fibromyalgia, multiple sclerosis, complex regional pain syndrome, and tumors of the syrinx or spinal cord. The disorder can sometimes be diagnosed in a physical exam by tenderness in the supraclavicular area, weakness and/or a “pins and needles” feeling when elevating the hands, weakness in the fifth (“little”) finger, and paleness in the palm of one or both hands when the individual raises them above the shoulders, with the fingers pointing to the ceiling. Symptoms of TOS vary depending on the type. Venous TOS features pallor, a weak or absent pulse in the affected arm, which also may be cool to the touch and appear paler than the unaffected arm. Symptoms may include numbness, tingling, aching, swelling of the extremity and fingers, and weakness of the neck or arm..
Arterial TOS most prominently features change in color and cold sensitivity in the hands and fingers, swelling, heaviness, paresthesia and poor blood circulation in the arms, hands, and fingers.. There are many causes of TOS, including physical trauma, anatomical defects, tumors that press on nerves, poor posture that causes nerve compression, pregnancy, and repetitive arm and shoulder movements and activity, such as from playing certain sports.